Holly A. Evans, MFT Therapy for for Women and New Moms-specializing in trauma recovery, women's mental health, and postpartum anxiety and mood disorders. Offering EMDR and psychotherapy for PTSD, sexual abuse, physical abuse, emotional abuse, anxiety and postpartum adjustment. Pasadena Area Therapist. When you were anticipating getting pregnant and having a baby, it's likely that you expected yourself to feel happy, excited. Maybe even confident and in charge of the situation. You probably didn't imagine feeling consumed with worry that keeps you up at night, or terrified at moments when certain thoughts cross your mind. Yet this is how many women experience their first months or years of motherhood. Feeling out of control, overwhelmed, and helpless. This kind of anxiety is like a thief, robbing you of the ability to enjoy the time you have with your brand new baby. Most new moms experience a certain amount of fear and anxiety. However, some women become overwhelmed, preoccupied, and ruled by their fears. According to Postpartum Support International, 6% of pregnant women and 10% of postpartum women develop anxiety- sometimes alone, and sometimes with depression. When anxiety and fear begin to change your behavior and inform your decision making, it can become very hard to trust yourself, and hard to ask for help from people who might be able to support you. Moms with a history of trauma or abuse may be especially vulnerable to anxiety and constant worry about the safety of your own children. Unwanted thoughts, fears of something bad happening or disturbing memories make it difficult to think clearly and make good decisions for yourself and your baby. Relationships can become strained, and sleep deprivation makes everything worse. Learning how to quiet your anxiety and tune into your own instincts about how to be a mom is no easy feat. Moms are bombarded with all kinds of messages about the “right” way to parent, and how you’re supposed to feel about being a mom. There is no shortage of judgment, real and perceived. Becoming a mother changes your sense of who you are, and it's important to allow yourself explore how you're changing, growing—and how you're struggling. You've taken on the role of “mom”, and you may feel like there's no room for you to be anything else right now. It's important to acknowledge aspects of yourself and your life that feel lost or out of reach, and to make room for yourself to feel whatever you feel about how much your life has changed. Your values and beliefs, your hopes and dreams, and your most important life experiences can help you find your way to being the mom you want to be. When you're going through a stressful time, it takes a lot of work to try to “hold it all together”. Working so hard to push your emotions down to get through the day, or putting on a good face can be exhausting—and you may end up finding it difficult to take care of yourself in the most basic ways. During a crisis, a major life change, or while struggling with your mood and anxiety, your basic physical, social and emotional needs can easily slide to the bottom of your list of priorities. For many people, the notion of self care can sound foreign, unnecessary, or even selfish. It can seem easier to keep pushing yourself through, but this can often prolong your problems. Whether you're a postpartum mom swept up in the moment to moment care of your family or someone struggling with anxiety or depression, tending to your own emotional and physical well-being can be a daunting, but very important task. Just a small boost can get you moving in a better direction. If you're going through a challenging time, your mental, emotional and physical energy can easily become depleted. Symptoms of depression, anxiety and PTSD can make it difficult just to get out of bed. Deciding to make big changes or set ambitious goals for yourself are not likely to be successful-or helpful. But by paying attention to the physical and emotional signals that your body and mind are sending you, you can identify small steps that can help you make a little bit of time and space for yourself. When life feels overwhelming, focusing on the simplest ways of nurturing yourself is more likely help you find relief. When you're busy just trying to get through the day, it can seem difficult to find the time and energy to do even the simplest things that might help you feel better. Depression, anxiety and PTSD commonly lead to difficulties in maintaining important relationships, and can make it difficult to meet the day to day demands of life(physically and emotionally). Asking for support(professional or from friends/family), deliberately checking in with a friend, or learning healthy coping skills can keep you connected to the important people in your life and the things you enjoy. Saying no doesn't come easily to everyone. If this is true for you, you may find yourself trying to make sure you don't let anyone down, even when it means sacrificing your own well-being. Asking yourself if you need to start saying no, let go of a few commitments or adjust your expectations of yourself is a good place to begin. And if saying no brings up feelings of guilt, self doubt or anxiety, then this might be a good time to take a look at how this issue is really impacting you. Having a baby is to supposed to be one of the happiest times of your life. But what if it isn't? If you've recently had a baby and aren't feeling like yourself, you're not alone. As many as 15 to 20% of new moms experience changes in mood that make taking care themselves and their new babies a struggle. Bringing a new baby home-whether it's your first or your third child-will naturally create some upheaval and stress, even in the best of circumstances. But if you're noticing significant changes in your mood past the first several weeks postpartum, it could be more than the “baby blues”. One of the things I make sure new moms know is that postpartum depression and anxiety is one of the most common complications of delivering a baby. They're often surprised and relieved, because they feel so alone in their experience. It can seem like every new mom is so together, handling new motherhood with confidence and joy. But appearances can be deceiving, as many women struggling with postpartum depression and anxiety are really good at masking what they're going through. Any woman can be susceptible to postpartum depression and anxiety, regardless of age, income, ethnicity, how much support you have in your life, or how well your pregnancy and delivery went. According to the American Psychological Association, for half of women diagnosed with postpartum depression, it's their first depressive episode. 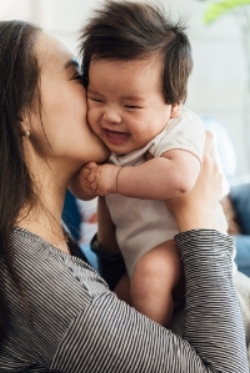 It's common to hear new moms say that it doesn't make sense that they're experiencing problems with mood and anxiety when things in their lives are going well. This confusion can fuel guilt and cause women to stay quiet about what they're going through, ultimately preventing them from getting help. Depression and anxiety can make just getting through the day exhausting-emotionally and physically. Many women feel wracked with guilt when they have thoughts and feelings about their babies and motherhood that aren't happy ones. Postpartum depression is treatable, and with support you can feel better. Reaching out for help from family and friends, support groups, or seeking therapy is important. Postpartum depression doesn't usually just go away on it's own. Understanding what you're going through and that it isn't your fault is an important part of finding your way back to feeling more like yourself and living a healthy, happy life with your new baby. Holly A. Evans, MFT, trauma therapy and EMDR(Eye Movement Desensitization and Reprocessing) for trauma surviviors (including sexual abuse, assault, emotional and physical abuse), PTSD, anxiety, and postpartum depression/anxiety. Serving South Pasadena, CA and the greater Los Angeles area.